With an 18-year career to fall on experience, Avant-Garde electronic duo Markus Detmer and Timo Reuber return with 9 tracks that move on from the Neo-Krautrock edge, whilst displaying tinges of previous influences that helped them formulate a healthy fanbase. The blissful ambient openings of ‘Ante’ soar into the psychedelic pulses of ‘Passage I’, with low-end rumbles gradually lifted above the electronics as skittish pads and wire-like grit threads its way through the mix. In contrast, ‘Express’ revels in past influences and is an altogether heavier affair that combines modern day trance sensibilities filtered through raging full on Hawkwind structured mechanics and pace. This is equalised out in contrast with the frantic experimentalism of ‘Station’; which is more of an interlude than an actual song. The title track fuses airy ambient pads that meld into the most surprising moment of the album. A fusion of dub infused tribalism that takes an altogether more Industrial slant, clawing with a well ground-in dirt that grabs the listener by the throat and shakes them to the core. 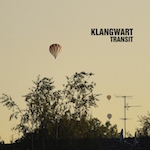 Again, Klangwart counter this with something completely different in the form of ‘Plateau’; an ambient number that hides a threatening psychosis amongst its pleasantries. Whilst ‘Passage II’ carries on from where its partner in crime left off, ‘Exile’ mixes elements of them both into a sea of developing sounds that gradually tumble over themselves as to form a rhythm without any actual beats; and dissipates just when you think everything’s about to kick off. Closer, ‘Rendezvous’ picks up the baton left on the ground by the title track and melds everything previously explored on the release amongst a wall of bastardised trance and furious complexities. Detmer and Reuber have created here, an album that revels in past glories and brings it forward with an uncompromising modernity; and who thought Krautrock could sound so good?